In the midst of the dog days of summer, the U.S. is still having its third-hottest year on record through July. 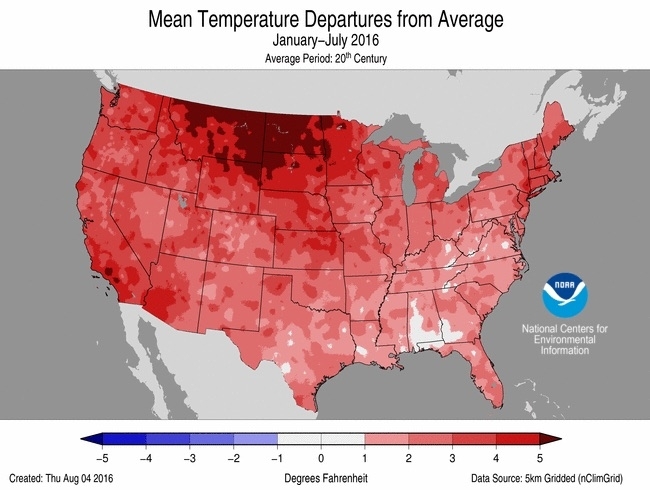 The month also saw two states — New Mexico and Florida — clinch their hottest July, while Alaska continued to stay on track for its warmest year in the books. For the contiguous U.S., the year-to-date temperature was 54.3°F (12.4°C), or 3.0°F (1.7°C) above the 20th century average, according to data released Monday by the National Oceanic and Atmospheric Administration. Every state was warmer than average for the same period. “The January-July period was the third warmest by a fairly wide margin,” NOAA climatologist Jake Crouch said in an email. The U.S. has been just one hotspot on the planet, which is having its warmest year on record by a good margin. The globally hot year is largely the result of the excess heat trapped by ever increasing amounts of greenhouse gases in the atmosphere. Temperatures this year have edged close to 1.5°C above the average for the late 19th century, before warming had much of an impact. Nations have agreed to limit warming this century to below 2°C, with some discussion of aiming for the tougher 1.5°C threshold. For the Lower 48, July was 75.3°F (24°C), or 1.6°F (0.9°C) above the 20th century average, the 14th warmest on record. The hottest areas of the country were in the southern and eastern regions, courtesy of a ridge of high pressure that ushered in a widespread heat wave and dry conditions. That heat boosted New Mexico and Florida to their hottest July on record (New Mexico tied with July 2003.) July was the second warmest of any month for Florida, behind only June 1998. While much of the country sweltered, “that heat wasn't felt by everyone,” Crouch said. Parts of the Northwest and central U.S. had above-average precipitation, which helped keep temperatures down to near average. They also partly offset the heat elsewhere and kept July from ranking higher nationwide. While the U.S. has stayed hot all year, it’s too early to say where 2016 will end up in the record books. One source of uncertainty is the possibility of a La Niña developing, which tends to lead to cooler temperatures in some areas. Forecasts have recently backed off on predictions for a La Niña event and have predicted a later appearance for the climate phenomenon than previously. 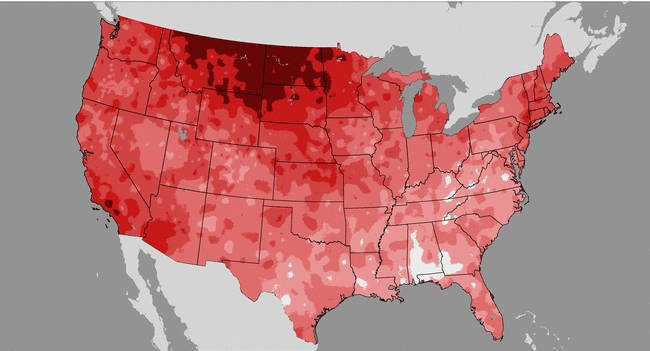 The outlook for the next few months is for above-average temperatures across the U.S., so “it is likely that 2016 year-to-date temperature averages will remain in the top five category during the next couple of months,” Crouch said. Alaska, meanwhile, has continued to be a standout spot for unusually hot temperatures and is on track to see its hottest year on record. Statewide, July was the fourth warmest on record, and several spots surpassed previous marks. Ted Stevens Anchorage International Airport had a monthly average temperature of 62.7°F (17°C), the warmest month observed there since records began in 1953.